Perhaps the major factor that has contributed to honeybee 'colony collapse' throughout the world has been the spread of a parasitic mite, varroa, with the appropriate scientific name varroa destructor. 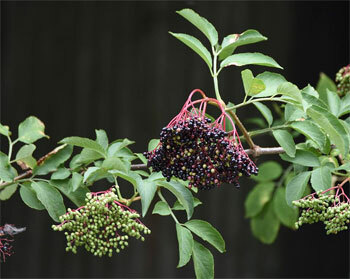 It is thought to have originated in the Philippines, some 50 years ago, being first noticed in the UK only as far back as 1992. Its spread has been so rapid and all pervasive, it is found in just about every single colony in UK, mine included. 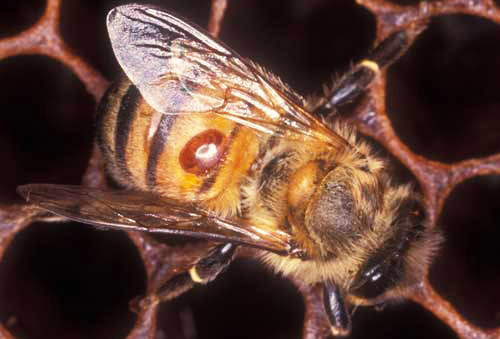 It would appear there is nothing beekeepers can do to keep varroa out of hives, and so over the past 20 years what beekeepers have learned is how to live with and control varroa numbers. There has been a massive number of articles and scientific papers written about varroa control, and certainly was a major topic covered on my beekeeping course. 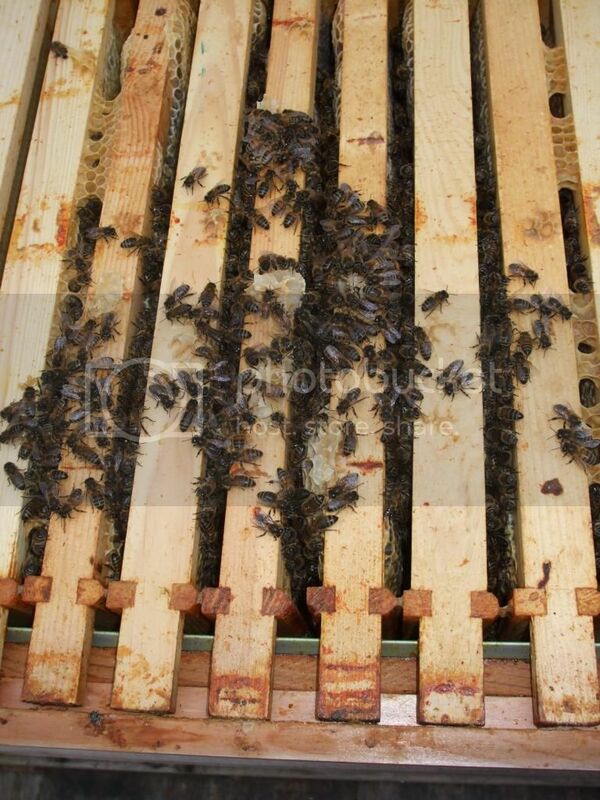 Pre-varroa, hives usually sat on a solid wood base. The first step in varroa control has been effectively to open up the bottom of the hive and sit it on a metal mesh base. This arrangement means that when the varroa fall from the bees, they fall through the mesh floor and cannot get back up into the hive. Also by putting a removable board under the mesh floor the beekeeper can count the number of mites that drop through in a 24 hour period, giving an indication of bad (or not as the case may be) the infestation is. My second line of control this year has been to dust the bees with icing sugar after finishing an inspection. This may seem strange but theory is that this not only gives the bees a sugary treat, it encourages them to groom themselves, hence knocking varroa off (and thorough the mesh floor). 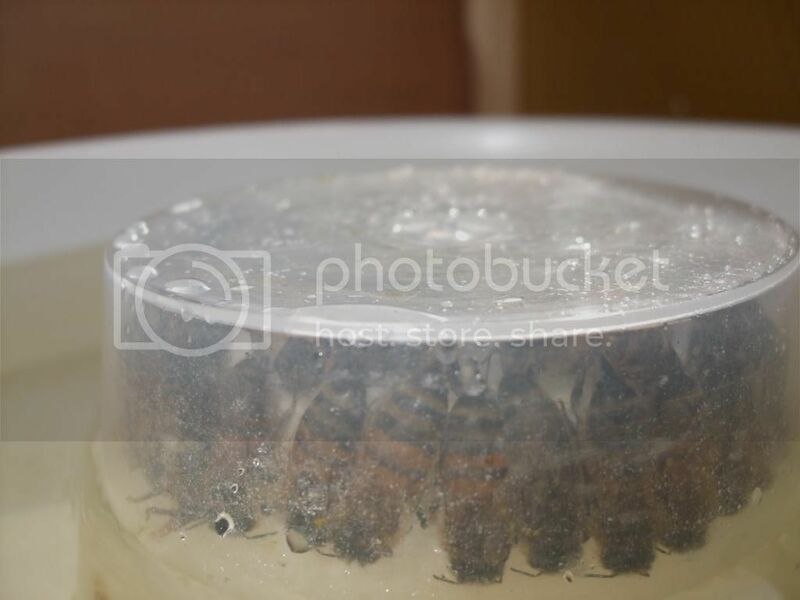 As we are well into autumn now, and the colony is preparing for winter, I have been treating the hive with a chemical, Thymol, which is administered as a paste that comes in thin foil containers that you simply sit on top of the frames. This is designed to kill the mites but, hopefully, not the bees. 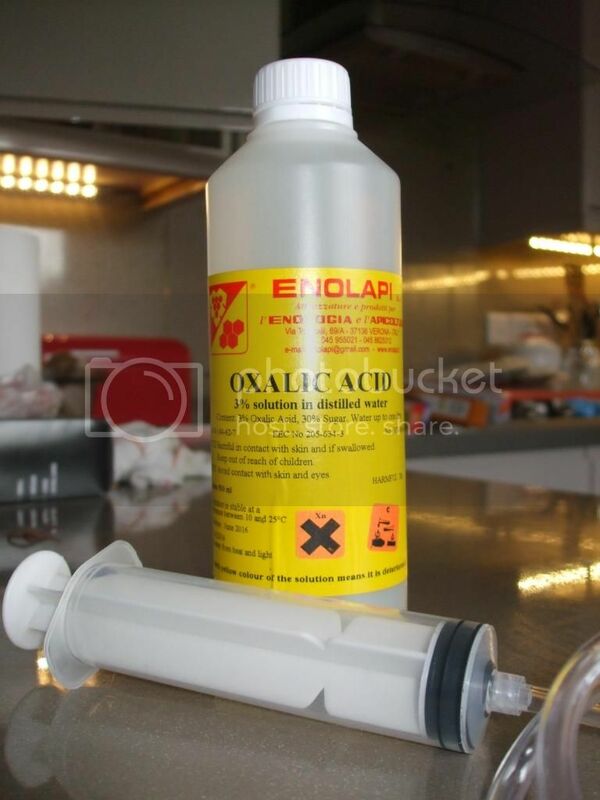 There is a final weapon that I am not sure if I will use - I need to talk to people far more knowledgeable than myself at or local beekeepers association - and that is to use Oxalic acid. It sounds pretty drastic and is administered in the winter and apparently doesn't do any harm to the bees. The photos below are not mine, by the way, but some I found on the web. Just read through your thread - Absolutely fascinating! I would love to keep bees and love the idea of an omlet behaus. They are pricey, but are 2 hives really. Varroa is a menace but appears to be something you just have to live with. The two biggest worries for me are varroa and swarming. I'm no expert but if you are diligent,I'm told both are manageable. The more I learn about bees the more incredible these tiny creatures are. I'm not overly bothered about harvesting the honey, I have just become obsessed with bees I still be totally gutted if they don't survive the winter. I love reading your thread about the bees...I WILL have them one day..they are fascinating aren't they....and keeping them healthy and in numbers is so important. On the same topic....Have you seen the doco "Silence of the bees" ...scarey stuff and the hands of the planet is so dependent on their survival. 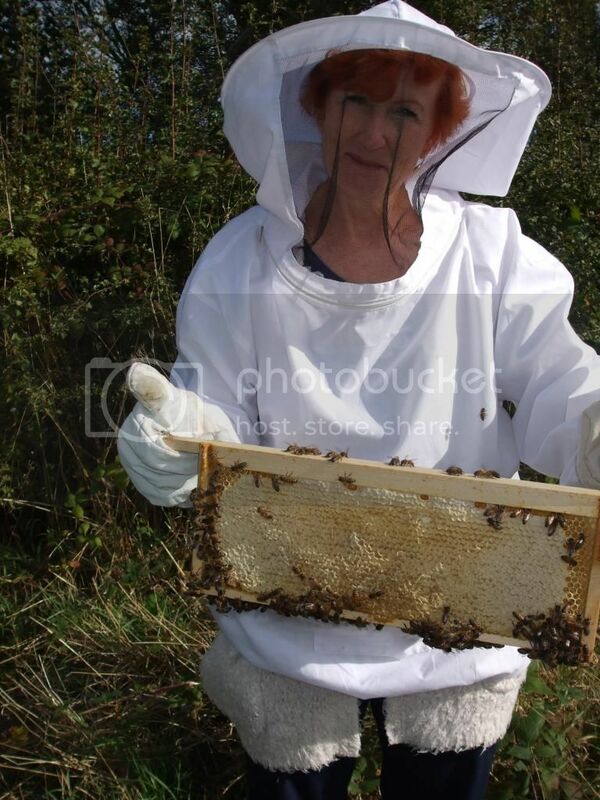 As you probably realise, I am no expert beekeeper. The problem is that as a novice there is so much conflicting advice. Get two beekeepers in a room and ask them a question, and you'll get 10 different answers. That said, we've joined our local beekeepers association (Durham) and the people there are not only very passionate but also very knowledgeable. As winter draws ever closer there is not a lot to do really, other than treat for varroa and make sure the colony has enough stores to see them through the winter. Beekeepers with established hives will have extracted their honey, but I will be happy to see my hive over winter and am not bothered about getting any honey at this point. Just doing my bit for bees is reward enough. towards the top of the home, be that a hive or the hollow of a tree. So having made the decision to leave the stores on the top, I then removed the queen excluder. 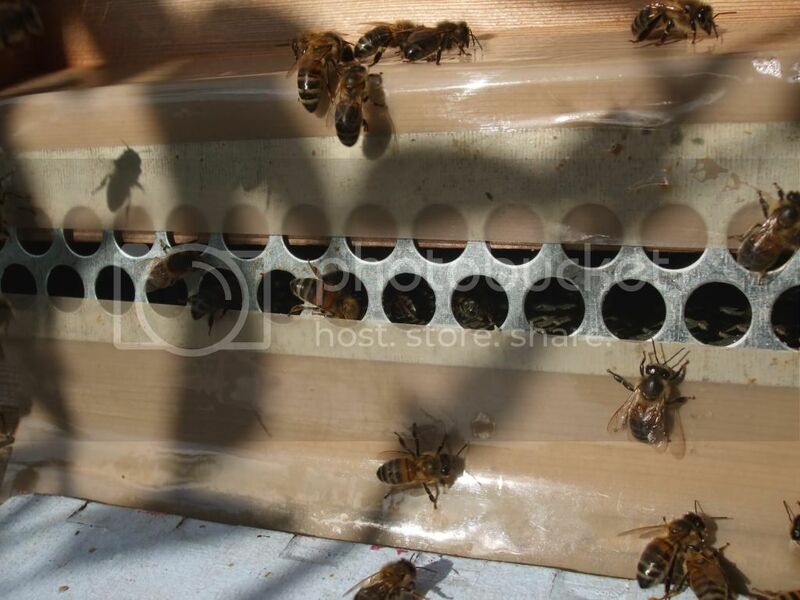 If the stores are on top, the bees will naturally move up towards the stores and if the queen excluder is on, then there is a danger that the poor old queen gets left in the brood box on her own and will freeze to death. So that's what we did at the weekend. It seems that a strong colony, mine not quite that yet but nonetheless has done very well over summer, needs in the region of 60 to 80 lbs of honey to see it through the winter. That's a honey box of 10 frames full of honey. It's a bit difficult to tell, but my hive seems a little short so this week I have feed them on a mixture of 2 kgs of sugar dissolved in a litre of boiling water. This thick syrup, which has less water than less concentrate mixture you might feed them in the spring, makes it easier for the bees to process and store. That's the theory, let's see how it goes. A full frame of honey. 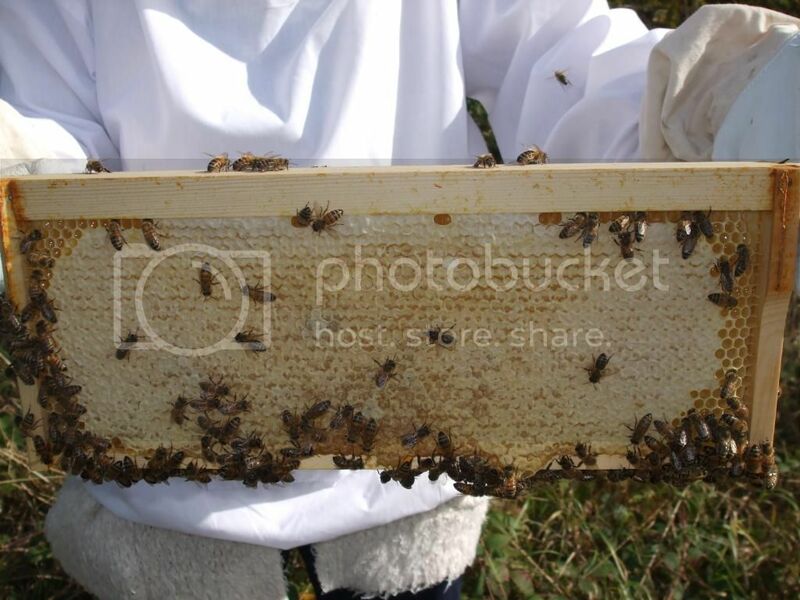 Notice the wax cappings over the honeycomb cells that have been packed with honey. The weather, for the time of the year, has been beautiful today but inevitably, autumn is here and winter is coming. The bees are still flying, and bringing back pollen and nectar to the hive. But, it must be getting harder for them to find good sources of foraging; I have noticed the Himalayan Balsam is just about finished, and there aren't too many plants yet to flower. In order to boost their stock of winter food, over the past couple of weeks I feed the colony nearly 4 kilos of sugar. I mix 2 kilos of sugar with 1 litre of boiling water and put in a feeder that sits over a hole in the crown board (simply a piece of plywood that sits on top of the hive. I did a final inspection today. Everything looks as it should be and as there won't be honey to remove this year and the colony won't swarm this late, I think I will leave things as they are and stop the weekly inspections. I may inspect and treat for varroa in January but it very much a case of leaving them to it now and crossing my fingers and hoping they make it through the winter. I have done about as much as I can for them for this year. The bees feeding this afternoon. Once they have got through this lot, that's it, they should have enough stores for the winter now. 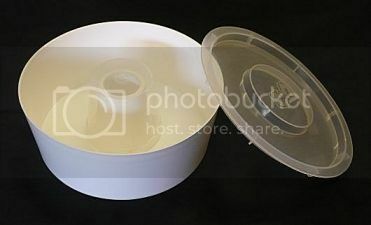 Here's a picture of a feeder I found on the web. The bees crawl up the central cone from the hive below and down the outside of it to get to the sugar mixture. Can't wait for Spring I'd imagine. Next year Honey !! From the size of your set up, how much will you get at a guess ? Richard wrote: Getting well on top of things there Micheal From the size of your set up, how much will you get at a guess? A colony will produce between 60 to 80lbs of honey per season but they need something in the order of 30lbs of honey to get them through the winter. So, in theory, you can rob them of 30lbs of honey per hive. Just to give an idea of the effort the bees put into this output, they have to fly 55,000 miles to produce a single lb of honey. After you have spread your honey on your toast, you probably leave on the knife a bit of honey that represents the entire working life of a couple of bees. Mad when you think about it. That's good, so in theory 30 - 50 jars (I think!). I prefer set honey myself, I have a bit of a phobia about sticky fingers and find the runny honey hard to get on with. So far, October has been amazingly mild, but, no doubt, winter will be here soon. And winter means that food is in short supply for most wildlife, including mice. And mice, if hungry enough, will raid bee hives in search of energy giving honey. So today, I fitted a mouse guard to the entrance to the hive. It is simple a metal grid that is just large enough to let the bees through but small enough to keep mice out. The holes make it a bit of struggle for bees to get in and out, and so you don't leave the guard on the rest of the year when the bees are really on a honey making roll. The mild weather still is giving the bees the opportunity to get out and about foraging. Yesterday, they were still out collecting nectar and honey. Here's a great photo - just taken on a mobile phone. That is a stunning photo. And quite scary too, they remind me of a Dr Who episode with the giant wasp. I have loved reading your tales of bee keeping, please keep up posted on how they're doing over the winter. I've got mortar bees living in my walls and haven't had the heart to stop up their burrows (i really should, they must be damaging my walls and they aren't cavity ones). I'm planning to build some bee boxes over winter so they have somewhere else to go next year - it's so important to help the bees along. Varroa is an awful lot bigger than I thought it would be! I've heard it's an absolute scourge. 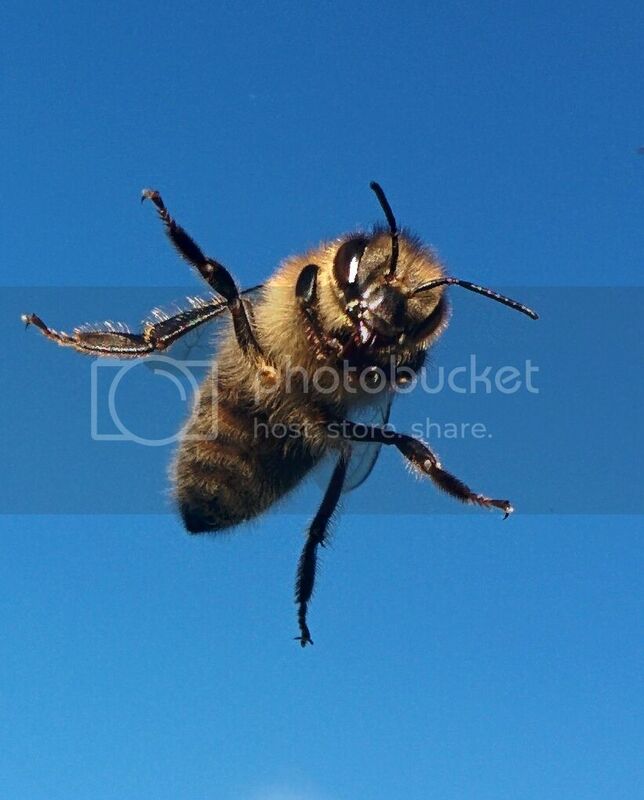 If it can drop off and not get back on, how does it get onto the bees/into the hive in the first place? KarenE wrote: Varroa is an awful lot bigger than I thought it would be! I've heard it's an absolute scourge. If it can drop off and not get back on, how does it get onto the bees/into the hive in the first place? From what I have learned, controlling varroa is very much a numbers game. So keeping bees with open mesh floors through which the varroa drop is just one way of keeping on top of them. They drop off the bees anyway to lay their eggs in the cells of developing bee larva, so they are all round nasty like things. Dusting the bees with icing sugar during the summer. The theory is that it encourages the bees to groom and knock he mites off themselves. The jury seems to be out as to whether this is effective but doesn't do any harm. It's a tricky business this beekeeping lark with no guarantee of success even if you know what you are doing, let alone if you are an amateur like myself. Anyone else thinking of keeping bees next year? Do let me know I'd be really interested to hear how others get on. There's not a lot of beekeeping to do in the winter months. The size of the colony has decreased from about 40 or 50 thousand at its peak to round about 10 thousand now. It is interesting that worker bees raised in the spring and summer only live for about 6 or 7 weeks but those raised late autumn are destined, not to go out foraging, but to stay in the hive over winter and will live for about 5 or 6 months. Honeybees don't hibernate during the cold weather. The reason why bees make honey, is not for us humans to rob, but rather as for a source of food and energy, and thereby heat, that will see them as a colony through to next spring. What they do when it gets cold is to form a cluster. They vibrate their wing muscles, a sort of shivering, and by doing so maintain the centre of the cluster at something like 32c no matter how cold it is outside. How amazing is that! I haven't opened the hive since early October but today, at end of December, I opened the hive and did the final varroa treatment for the year. It sounds rather drastic as the treatment is with Oxalic acid, though it is only 3% oxalic acid in a sugar solution. Varroa reproduce only by laying their eggs in the cells along with developing new bee larvae. When the new bees emerge, so do the new varroa, which will latch on to other bees. So at any point during the non-winter months, there are varroa not only on the bees, but also new varroa are developing in the capped bee larvae cells. So here's the trick. During winter, the queen will more or less stop laying. This means that the only varroa will actually be on the bees themselve. So if we can kill a good percentage of these, come the Spring, varroa levels should be extremely low and the colony should thrive. Well that's the theory. So in practice, you open the hive, count the number of frames the bees are on, in my case 7, and then dribble in, from a syringe, 5 ml of Oxalic acid per frame. As you can see they are a live and well and on about 7 frames. A few did fly round me but the cold weather kept them pretty placid today. For a January day, it has been relatively warm today, probably 10c in the sunshine. I haven't seen the bees out flying for a while but today there are a few venturing out. I can't see that much is in flower to interest them at the moment but at least I know they have survived the oxalic acid treatment.